CPO License® | Who Should Get Certified? Home » Blog » CPO License® | Who Should Get Certified? Every pool facility should have staff members that are CPO® certified. But who exactly needs a CPO® license in order for an aquatic facility to remain above-board with regulations? The simple answer is the more the merrier. But when it comes to what is actually required, things get more specific. Let’s look at who absolutely needs to have a CPO® license at an aquatic facility. Many aquatic facilities will hire an outside service technician to take care of routine pool maintenance. It is essential that this service technician has a CPO® license. Even when an aquatic facility uses a third-party service technician, the owner or manager of that facility should be certified as well. Some state codes require this, so be sure to check your state code for regulations. The owner or manager is responsible for evaluating the performance of the technician, so they should be knowledgeable. Hotel, motel, apartment, and condominium pools are normally classified as Class C pools. 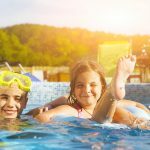 State code dictates whether or not pool operators need a CPO® license, but it is industry standard to have them certified. This is especially true when the facility is exempt from lifeguards. The manager or owner of the hotel should also be certified in the event of employee turnover. If one of these pools operates 24 hours a day, a certified operator should be on site at all times. Therapy pools are class E pools, typically operated by a staff of specialists. Pool operation is just one of many responsibilities in the facility. For this reason, a third-party technician with a CPO® license is hired in most cases. Competition, park pools, and water parks are classes A, B, and D, respectively. These types of facilities typically have a management team consisting of aquatics coordinators, maintenance personnel, swim coaches and lifeguards. Each level of maintenance personnel, pool supervisor, and facility director should all be trained and certified in pool operations. A lifeguard’s main role is preventing and responding to emergencies at an aquatic facility. Their duties include maintaining zone protection, administering first aid, enforcing the policies of a facility, assisting patrons, and providing CPR. A lifeguard usually is not responsible for managing or carrying out inspections for unsafe conditions, record keeping, water quality management, or performing other pool operations. However, they should obtain their CPO® license in the event they should have to perform these duties while not actively lifeguarding. If a lifeguard is responsible for both jobs, they may not perform them simultaneously. If the lifeguard has to stop watching over the pool, it must be closed to all swimmers. If you fall under any of these qualifying positions, you are going to need CPO® certification. The best way to get certified is by going to the pros. Pool Operation Management offers award-winning CPO® certification courses to give you the most comprehensive education in everything about pool operation. Over a two-day course, our experienced professionals not only will help you get certified, but you will acquire real-world knowledge to aid you in your career of pool operation.